By Chris Williams: In a poll created by Filipino superstar Manny Pacquiao, asking fans to select his next opponent, he made it clear that he’s NOT interested in fighting Errol Spence Jr. next by failing to list his name among the four – Floyd Mayweather Jr., Keith Thurman, Danny Garcia and Shawn Porter – contestants in the poll. What that means is pretty obvious. 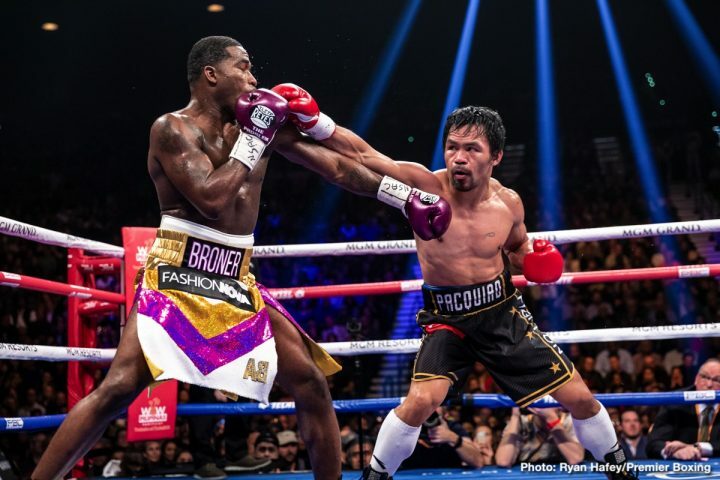 Pacquiao in’t going to be fighting the unbeaten IBF welterweight champion Spence Jr. (25-0, 21 KOs) in his next fight in June or July on Premier Boxing Champions on Showtime. Oh well, we knew it was too good to be true. Pacquiao vs. Thurman, here we go. It’s interesting that Pacquiao went into the ring after Spence’s victory over Mikey Garcia last Saturday night on March 16, and accepted a challenge to face Spence, but now he’s not even mentioning his name. What does that say? The boxing public got excited at hearing Manny accept Spence’s challenge. Is Pacquiao backing out now? As one would guess, Mayweather Jr. is the fighter the boxing fans are selectively overwhelming as the guy that they want to see fight the 40-year-old Pacquiao next. Unfortunately, Mayweather is also the least likely fighter on the list to wind up in the ring to challenge Pacquiao (61-7-2, 39 KOs) for his WBA ‘regular’ welterweight title. Mayweather, 42, is retired, and more focused on his investments, and making good money in his exhibition fights. There’s easy money for Mayweather to make fighting exhibition matches, and there’s need for hard training for him to win those type of fights. If Mayweather were to come out of retirement to face Pacquiao, he would need to train hard for eight weeks to get ready for that fight. It wouldn’t be easy work, the training or the fight for Mayweather. With him being retired for four years, he’s lost some hand speed, and it would be a tougher for him to beat Pacquiao for a second time. Mayweather defeated Pacquiao four years ago by a 12 round unanimous decision by the scores 116-112, 118-110 and 116-112 on May 2, 2015 in a fight dubbed, ‘The fight of the Century.’ The Mayweather-Pacquiao fight broke pay-per-view records that still stand today, and made both fighters a bundle of money. With Mayweather unlikely to face Pacquiao, the next runner up is Thurman (29-0, 22 KOs), who is the highest highest vote getter in Pacquiao’s poll in bringing in 12% of the vote. If Pacquiao is serious about wanting to fight the guy his boxing fans are choosing for him to fight, then Thurman is going to get the fight with Manny by default. Of course, if Pacquiao isn’t going to fight the #2 guy in the voting in Keith Thurman, then it comes down to either Danny Garcia [9% of the votes] or Shawn Porter [5%], who is coming in last in the voting.